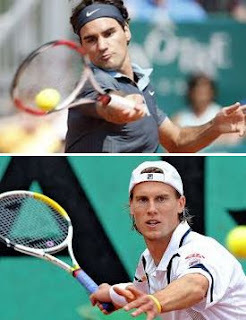 The fourth and the last quarterfinal match of ATP Rome Friday today is between the newly elavated to world no.2 ranking Swiss Roger Federer and 30th ranked Italian Andres Seppi. Roger marched in to the quarters after defeating J CFerrero 6-2, 5-7 and 6-1, while Seppi beat S. Wawrinka in a hard and tough match culminating 6-7(1) 7-6(6) 7-6(6). Seppi is not new to Federer as he has met him eight times before since 2007 - although with no win as Federer has cleaning winning edge of 7-0 over Seppi. Of the last ten matches played by each player, the Swiss has lost only once at Miami at the hands of Roddick, while Seppi has had two setbacks at ATP Madrid and Bucharest earleir this year.